This entry was posted in Blog, Food and Recipes, Photography and tagged Big leaf maple syrup, weekly photo challenge: treasure. Bookmark the permalink. I LOVE maple syrup 🙂 We don’t have any sugar maples, but some of our neighbors do. I bet you make great syrup. Fingers are crossed! At this point (after many hours of boiling) things can go terribly wrong in a hurry if the syrup gets scorched (which happens when the percentage of sugar increases to a point where the temperature rises fast and furious and the whole batch is doomed!!) We were all gathered around the stove watching and tasting and monitoring the thermometer… Fun times on the farm! Was that rainbow on Friday? I was at a funeral service at RVYC, and just after it was over, there was a beautiful, strong, double rainbow over Cadboro Bay, which stayed for several minutes, both ends in the bay. And I can’t WAIT to hear how the syrup turns out. Here’s hoping you don’t scorch it. It was indeed on Friday – I didn’t see the double rainbow, but the single was intense and complete and did seem to touch down right about where our maples are! The first batch finished late last night and we managed to get right to the end without ruining it! It tastes great! A bit different to eastern maple syrup (which makes sense) but really good. Waffles need to be on today’s menu!! Wow, what an excellent rainbow shot! Is that with your phone? Indeed it was a phone capture. 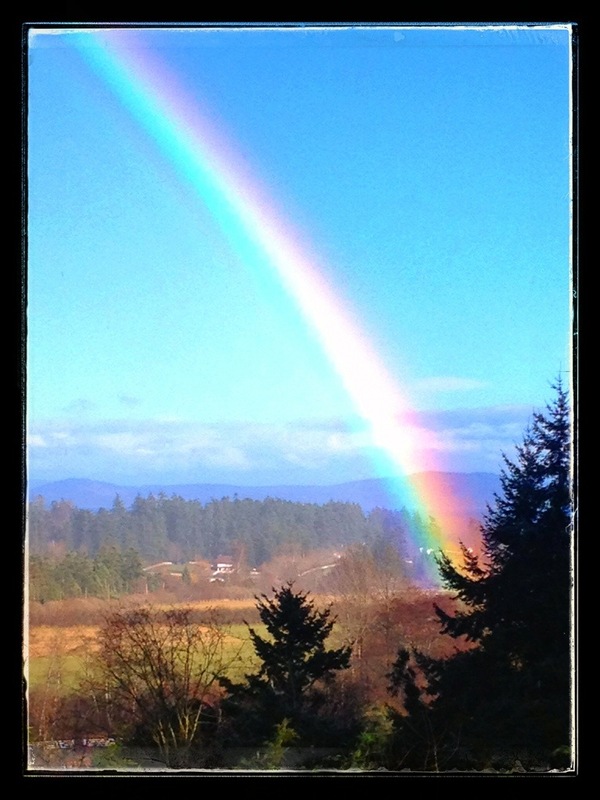 It was a particularly intense rainbow and then I did enhance the contrast slightly in snapseed (also on the phone). It’s amazing what these phone cameras can do!